All of your creations are so exciting, and hope you haven't gotten too depressed for raiding your hoard. As you said, now you can go fill the empty spots. And thank you so much for including my beads in your first design, it's an honor to be included. haaha .... love the above comment too .. about letting go.. I love Your wrap bracelets with all those different knots beads and colors great Job !! What a great piece Sherri- love that you used so many artists work together. I was also tickled to see my dragonfly pendant in that first picture of your stash. You never need an excuse to buy beads :-) I love what you did with your hoard (and I feel the same way about my artist beads. They are supposed to sit in the box and look beautiful, not actually be used (the horror)! I love this, Sherri! It was fun to peek at your collection and be inspired (unfortunately I was also making a mental shopping list LOL). Yes, this hop might have caused a FLURRY of buying LOL. Nice stash and great wrap. Keep knotting. Great stash! I'd have trouble parting with any of those beauties. You do wonderful work, very pretty. omg...what you created is gorgeous! Thank you for sharing your lovely stash with us! And the commentary cracked me up;) a true hoarder like most of us. And now, I think a major question for all us bead hoarders is, what will we do with what we have made? Will we keep these items and wear them? Will we offer them for sale? Give them as special gifts? Pack them away to savor as we did the original beads? Therapy indeed! ha! Your pieces are so beautiful, Sherri. I know I would definitely need serious therapy to part with these very special beads and your jewelry if I were you! Beautiful work! Love all your creations! hahahaha - I can't WAIT to see!! I love it! It is always nice to see another hoarder's private stash! You do wonderful thing! I love what you made and could not agree more with the not using them on a on a project that wasn't the perfect project for them, I think that maybe the cause of my stash, I see some thing beautiful and then have to wait for the right design. I don't know the first thing about macrame but after seeing your lovely work - I think I better give it a try! I follow your work, it is always lovely, and I was really excited to see your stash! I think the little house bracelet makes me smile the most! umm... yeah. About that. I loved the little house so much and I hated not having one in my stash, so I ordered 7 more LOL. True. So unique and creative. They are all lovely! I second that Audrey! I wish my stash looked that good...LOL LOVE all of your pieces...I really got to get myself learning to do the mini macrame.. I don't think that you wasted your beads. Both bracelet are gorgeous and your stash is...OMG! Wow what a stash, I love your pieces. I also love all your micro macrame, so very beautiful. Loved all your treasures/stash!!! You have good stuff!!! 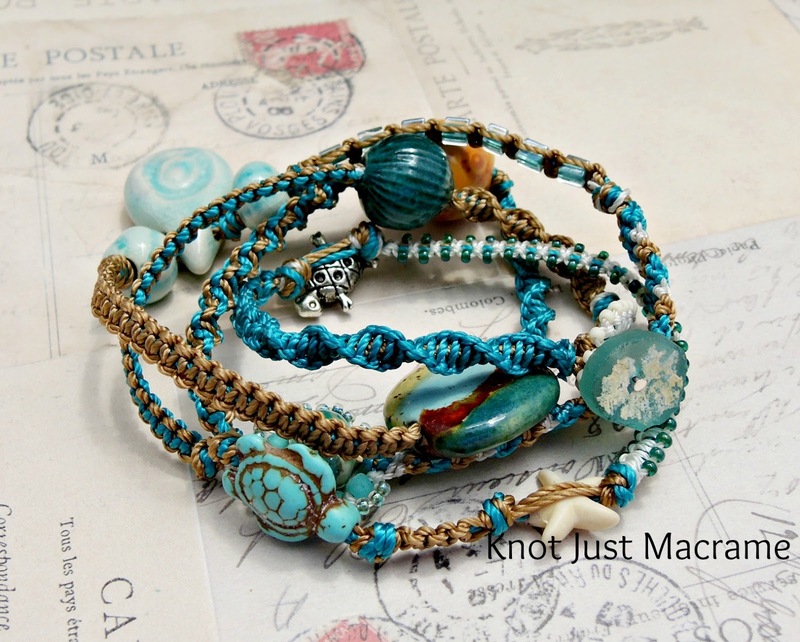 And I always love your mirco macramé designs...fabulous! Would it be possible to write some written instructions like how much cord and when to switch and add beads? It very helpful so I don't waste cord. 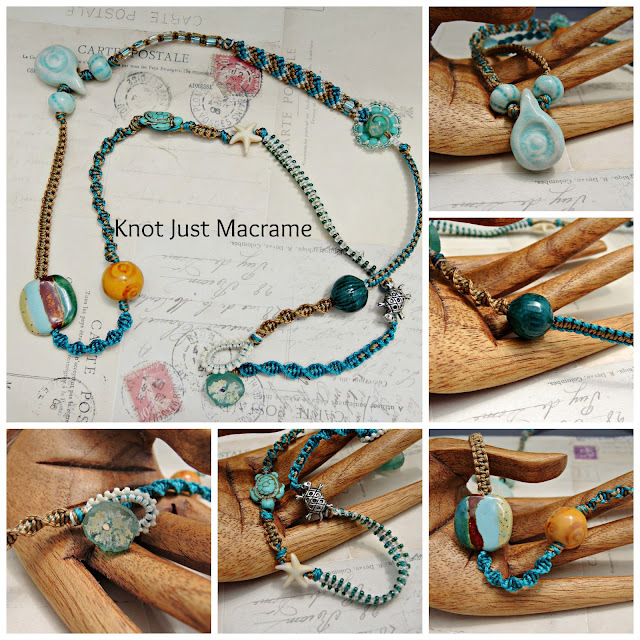 These cool summer colors and the art beads and macramé and beads and the Roman glass. Oops, got lots in the beautiful designs. I think follow up therapy is just what the doctor ordered. Carry on. Great job using some of your beautiful treasures Sherry. I love what you did with your hoarded beads and those treasure boxes sure do have me feeling faint. They're just awesome! Wow! you do awesome things with your micro-macrame. I love the bracelets. Thanks for sharing pics of your beautiful stash, too. OMG what a stash! So many lovely beads, I'm envious. Gorgeous necklace. Wish I knew how to macrame. Love your wrap! The addition of the tiny house makes it my favorite! That is too sweet! I want one for my stash! Drool! I LOVE your pieces! Drooling over your stash too! Bless your heart, you were so brave! I completely understand the urge to nuzzle the beads...these are gorgeous pieces, though, and a wonderful use of the treasures you could bring yourself to nudge out of their cozy homes. I particularly love the variety of knotting in the second bracelet, which must look very cool when worn! I feel dizzy and my heart is racing now. Your treasures are a serious bead hoarders paradise! !